Marti Roca de Torres hit the ultimate parlay by turning an online satellite into a WSOPE Main Event win. The final few tables of the World Series of Poker Europe final table carried some of the biggest names in poker and numerous storylines. Maria Ho, Niall Farrell, and 2015 WSOPE Main Event champion Kevin MacPhee dominated the marquee leaving players like 888poker.comsatellite qualifier Marti Roca de Torres to fight for their own piece of history. The former economics teacher left his position two years ago to pursue poker on a full-time basis. Roca de Torres makes his primary living on online cash games and mid-stakes tournaments. As a Spanish resident, he is only able to compete against his countrymen online and this tournament served as the largest buy-in ever played by him. Roca de Torres managed to claim victory in a memorable final table and complete his journey from noticing some overlay to walking out of Kings Casino with over €1 million. This satellite attempt was the third for Roca de Torres, who prefers to stay close to his family in Spain and not travel relatively far for live events. With that mindset, Roca de Torres rarely plays satellites but this opportunity was too good to pass up. The 36-year-old Spaniard looked at the WSOPE Main Event as a chance to rectify what had been a subpar few months for him. Roca de Torres was winning for the first half of 2017 and then hit a downswing in August and September. His mindset shifted more toward putting himself in a spot to make a deep run and then go from there. On the bubble, Roca de Torres eliminated Ole Schemion with a straight-over-straight cooler and then proceeded to run his stack up from there. It wasn’t until the bubble burst and Roca de Torres found himself among the chip leaders did he think he might have a chance to at least make the final table. Once there, the confidence of Roca de Torres grew with every elimination. Shorthanded play became an arduous process for Roca de Torres. The chip lead escaped his fingertips on a few occasions but when it mattered most, he managed to hold on in all-ins and claim an unlikely win. The mental impact of winning didn’t hit Roca de Torres until he celebrated with friends and family. The ‘wow’ moment did not arrive immediately as, after six days of poker, Roca de Torres found himself exhausted. The bankroll boost for Roca de Torres allows him to invest more in his family and increase stakes online. He says his new goal is to be a consistent NL500 player online and maintain the limited live poker schedule he kept before the win. With his second child soon to be born, Roca de Torres looks forward to spending more time with his children and use his win as a nest egg rather than a means to live off of immediately. 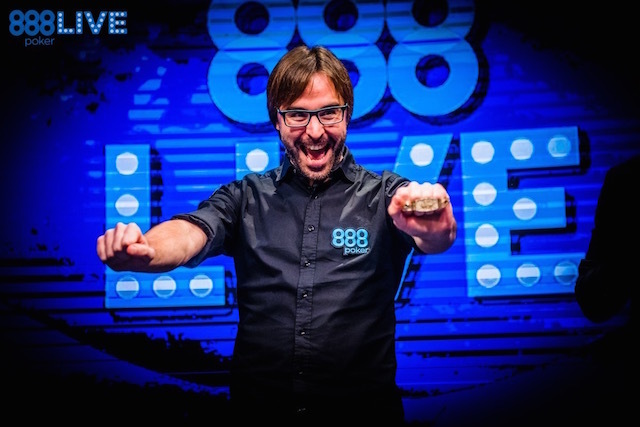 888poker.com produced yet another satellite success story from Spain from Roca de Torres in what is a growing market. With a new year of major events ready to start in a few weeks, the next Marti Roca de Torres is sitting behind a computer waiting for the chance to be discovered.